Aren't these castles just the cutest things??? You can find Claire Brennan's tutorial for them here. They are about 12" in height including the flag pole! I made this one using the fun Basic Grey Lime Rickey/Liquid Candy designer paper for the castle panels. The base is a green Bazzill card stock. The knight is from Lizzie Anne Designs and the trees and sentiment are from two different Cornish Heritage Farms sets - Making the Grade and Forest Friendzy. I adhered a tree on each side of the castle as well as a hedgehog or mushroom. 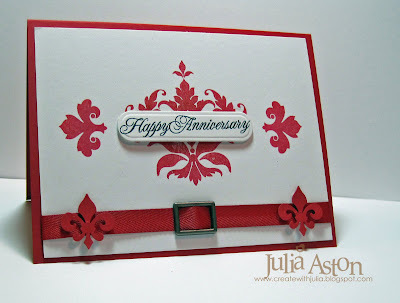 These are all the stampings I used on the castle and the card below. Here is a card I made to go along with the castle - using the same stamps. I used the Forest Branches Cuttlebug folder on the back panel and a Labels Four Nestability to cut the piece of designer paper. All the images are colored with Copics. I used the small oval Stampin Up punch for the sentiment on the castle. For the card sentiment I juse used the corner rounder on one end and cut out a triangle on the other end. Everything is popped up on foam dimensionals. This designer paper is Basic Grey Porcelain/bellamy. The base of the castle is Certainly Celery by Stampin Up. The chipboard trees are from Maya Road. On this castle I used the Distressed Stripes Cuttlebug folder on the roof piece and inked it with white chalk ink as suggested by Claire in her tutorial. The flag is just a strip of designer paper curled and glued around a toothpick with a triangle cut out of the end. And here is the coordinating card I made for this castle. The uses for this cute castle are limitless - wouldn't it be fun in pink and purples with a princess stamp for a little girls b'day? And they aren't as hard to make as they look - Claire goes through each step with pictures and written descriptions. I made one up with computer paper first just to be sure I understood each step - that way I didn't waste good card stock in the learning process! 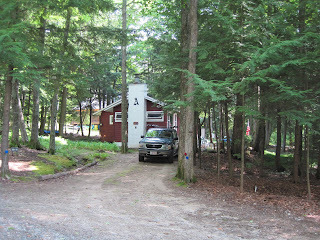 Thought you might like to see a few pics of our vacation: Here is a side view of my SIL's cottage in the woods from the driveway. 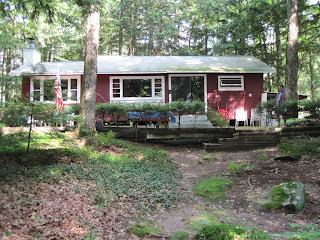 and here is the front view - we can see a little bit of Merry Meeting Lake through the trees - which is behind me as I'm taking this pic - the cottage is across the street from the lake but we have a right-of-way where we can access it. 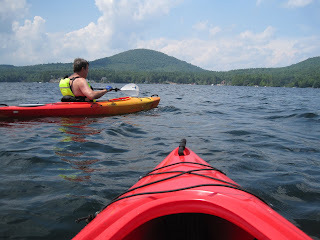 Here is Kent on the lake - and you can see the front of my kayak - we were out for two hours on this day - and just after we got back and up to the cottage we had a downpour! Rain can come quickly when you are in between the mountains here. And here's me! 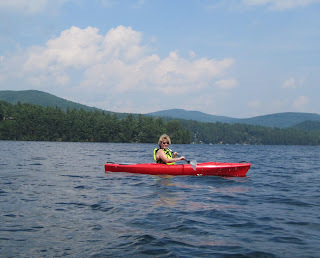 The water was pretty calm going down but on our way back we were heading into the wind - and we really had to paddle! 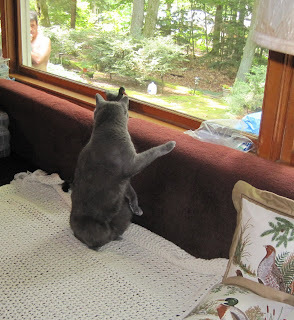 This is one of our cats, Boo, sitting on the favorite pet sofa by the picture window - watching Kent as he makes his way to the door! I wanted to share a Theater Stage card that I made for my friend, Bill, at work. His friend had just been in a production of The Follies in London (May 2009) and he wanted to send a congratulations card. Bill found a copy of the poster for the play on line - so I sized it down to fit on my 'stage' below. 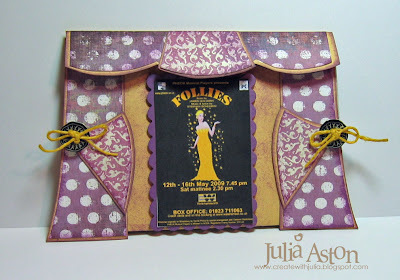 You can find the template for a circus tent card on Melyssa's blog. I just altered it a little bit to make it a theater stage. Basically I made the stage square and cut the top straight across instead of pointed like a tent. Here is the inside of my card. I used two velcro tabs on the top corners to hold the card shut. I used brown lined designer paper for the bottom half to look like a stage floor. The image is a computer clip art from Microsoft Word and the sentimtent is computer generated. Bill's friend was thrilled to receive this personalized card that documents his part in the Follies - and he has it proudly displayed on his mantel. It certainly is a one of a kind card! 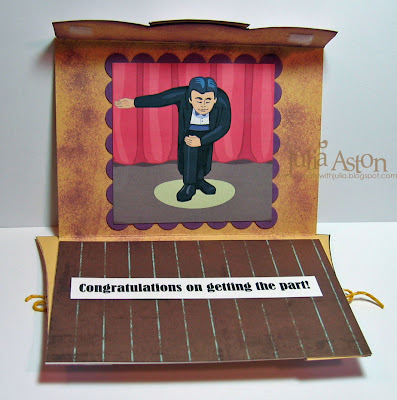 You can see another Theater card I made for my girlfriend's daughter's graduation here. Thanks for coming by to visit today! It's a beautiful hot sunny day and we're off to go kayaking on the lake! I'll hopefully have some pics to share later! I am so late in acknowledging these wonderful awards bestowed upon me by some of my blogging friends - there just aren't enough hours in the day! 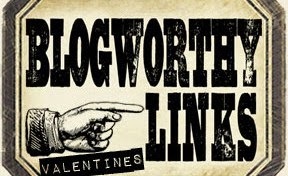 4) select 7 other worthy bloggers to receive the award and list their links. 1. I'm tall - I was 5'8" in 7th grade and hated it as I was taller then most of the boys at that age. Now that I've finally accepted my height - I'm shrinking - due to #2 below. 2. I'm getting old! I remember when the Miss America's were all WAY older than me - now they are younger than my son! 3. I am totally addicted to stamping - I'd rather stamp than go out to a movie, visit friends, or go for a walk on a sunny day - I'm currently seeking therapy for this addiciton LOL!!! 4. I love my DH and I'm so thankful that I met and married him 12 years ago after being a single mum for 20 years. 5. I'm thankful that God loves me and I find the older I get - the more I seek knowledge of Him and what he wants to teach me - and for that I am very grateful. 6. Contrary to my statement in #3 - I do love to be out in the yard gardening, or on the river kayaking, or in the woods snowshoeing! 7. I am always trying to practice good eating habits (ie dieting!) and sometimes I do better than others. 8. I love cutting flowers from my gardens and having them all over my house. This goes along with #6 above. 9. I love pizza and chips - and hot fudge Sundaes which is in direct contradiction with #7 above. 10. 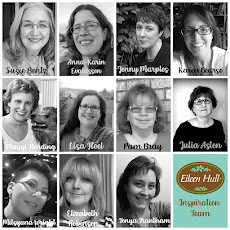 I am so thankful that I have met all of you wonderful blogging friends and I appreciate all I learn from your creative efforts! I'm afraid I'm just going to post these here for now - most of my blogging friends have already gotten awards from their other friends! Everyone that comes here to visit me deserves these - so please feel free to take one for yourself!! 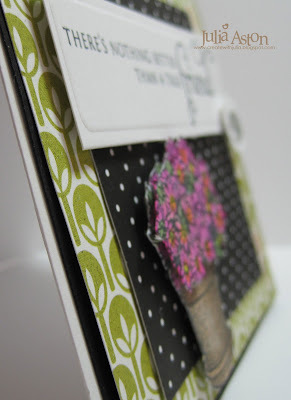 And now I'll share a card I made Saturday for the Inspiration challenge on Split Coast. We were getting packed for vacation and I just 'took a peek' at the challenge and of course, got hooked and just had to make a card before leaving (Yes honey - I'm almost done packing - I'll be right there!!!) LOL!! 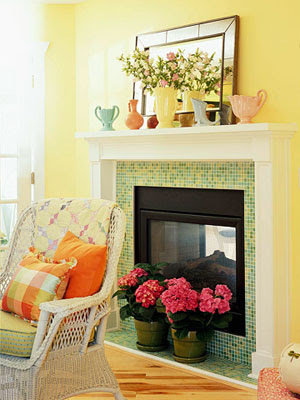 I used this fireplace view of the Better Homes and Gardens living room that Lori showed us for my inspiration. I thought the tree Basic Grey Designer paper could represent the tile surround and I used PTI polka dot designer paper for the firebox itself. I stamped the potted flowers by Inkadinkado twice, cut out the blooms on one and layered it over the first stamping with foam dimensionals. I have two gray kitties and I just love this tiny cat that's part of the new PTI set On My Couch Additions - so I just added that onto the sentiment with a foam dimensional. 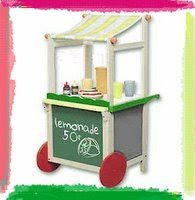 Thanks so much for checking in with me today - hope you are inspired to go make a card too! I'm on vacation and don't have any stamping stuff with me (gasp!!!) 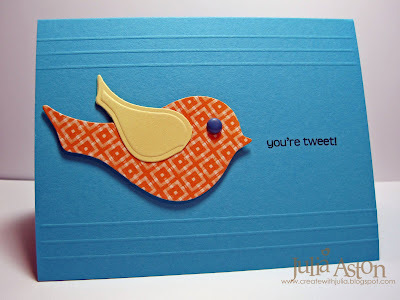 but I will be posting a few fun stamped crafts that I've made recently so be sure to check back! 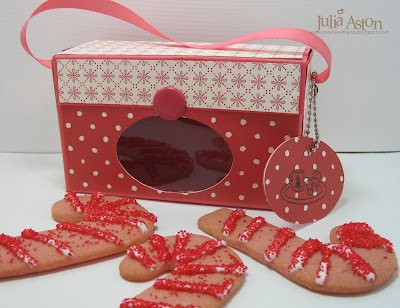 I found a great tutorial for these cute Animal Cracker boxes on Tracy Harp's blog. She shows several different samples to inspire you! I made mine with PTI Berry Sorbet card stock and Christmasey Amuse papers. I filled them with frosted candy cane sugar cookies that I made from a mix and colored with red food coloring. I used a giant brad from American Crafts that you slip the cover behind to hold it closed. I used my oval Coluzzle to cut the window and then used the cut out oval for the tag. A piece of acetate is attached behind the cut out. I hung my tag around the ribbon handle using a chain by Tandy Leather that I got at Michaels in the jewelry section. I stamped the tag with an Amuse stamp called "Santa's Cookies" of a fun plate of cookies and a mug with a note that says 'For Santa' on it. I couldn't find it on the AMUSE site so it may be last years stamp (?). I doodled around the edges of the tag with a black Micro marker. Note: I think you could use an oval punch for the window instead of the Coluzzle if it's strong enough to go through 2 layers of paper - but the box panel is too wide to use a Nestability oval with the Cuttlebug. My handles are made with PTI Twill in Berry Sorbet and Vintage Cream. You punch a hole in the side panels - add eyelets and knot the ribbon on each end on the inside. Wouldn't this be a fun way to leave cookies for Santa on Christmas Eve? Actually - it's a fun box to give treats to anyone for the holidays or any time!! Crystal happens to be one of my Split Coast friends so I'm thrilled that you won Crystal!! Please send your mailing address to [email protected] and I'll get your 'candy' right out to you! I made this card for the sketch challenge on Split Coast this week as well as the DoubleDog Dare Challenge I do on Tuesdays with a group of SCS friends. Charlene (LilLuvsStampin) was the hostess this week and her challenge was to make a Mr. Do Bee card (from Romper Room fame for those of you old enough to remember that kids show! )- something teaching a child about manners - and to include a bee! I love this Petite Cherub DP by Rusty Pickle - the little kids on it are so cute! I zig zag stitched around the edge and inked the edges with PTI Chai and Chamomile Dye inks. The key is Tim Holtz grunge board that I inked with Chai dye ink and Gold pigment ink. You can join in on the DDC challenge just add DDC to the keyword when you post your card. 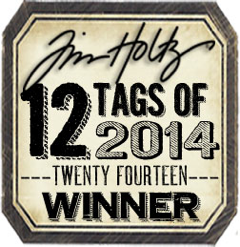 Thanks to everyone that commented on my blog candy post - I'm sorry you couldn't all win! I participate in a biweekly Bible Study Challenge on Split Coast - it's called His Holy Name and Patter gives us a different attribute of God every other Sunday. We are to look up passages in the Bible using this attribute and chose one that speaks to us and either make a card or a page. I make 6x6 pages for mine. I let it get away from me a bit and I'm 3 lessons behind - but now it's only two! For Week 13 Patter gave us God's attribute: Jealous. When I think of the word jealous I think of things like anger, power and punishment and that is what many of the passages talk about. In the passage I chose from Joshua - disaster happens if you forsake the Lord. We definately don't want to provoke God's jealousy! Come join us in these challenges -you can see week 13 here I used Archaic DP on this, chipboard letters by Basic Grey and a grungeboard element by Tim Holtz. I used the MOJO96 sketch for my card. My dear husband made this beautiful wooden stand to hold all my pages - actually he made two for me - since there will be 26 pages done by the end of the year. This page 13 marks the halfway mark - so my next page will go on the 2nd stand! This stand sits on my entertainment center so I can flip through the pages to review and remember each of God's attributes. The Clean and Simple challenge on Split Coast this week was to use the summer colors of turquoise, orange and blue. And as luck would have it - the DoubleDog Dare Challenge a few weeks ago made by Joanne (Sleepyinseattle) (which I hadn't gotten to yet!) - was to use orange, yellow and blue - so I'm hitting two birds with one card so to speak!! The bird is cut from the small and medium Shapeability Nested Birds and mounted with foam dimensionals on the card. I scored three lines above and below for a little depth on the card. Pretty clean and simple! The sentiment is from the Amuse stamp set called Nature. We'd love to have you join along with the weekly Doubledog Dare challenges - just load your challenge card in your SCS gallery and use the keyword DDC - you can see all the DDC cards here. Reminder: check here for info on winning my blog candy! 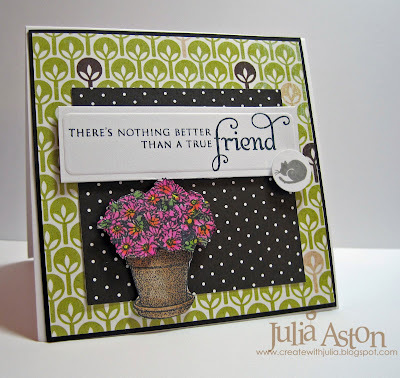 I made this card for the Featured Stamper challenge this week on Split Coast. Minnidr was the featured stamper and I chose her Spring Angel to CASE. 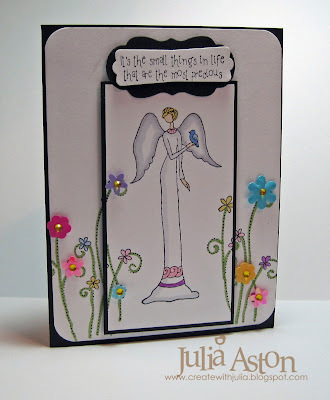 I used an angel from the same stamp company but one holding a bird instead of flowers and I used a different bloom stem stamp (Simply Said by SU) which I also over stamped on the top panel. I added little plastic flowers and gems over some of the stamped blossoms. I also added a sentiment to the top of the card. 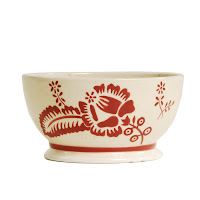 Happy Anniversary in a Bowl & Blog Candy! And here is the card I created after being inspired by it! I was away all day today teaching a couple of classes at the Papertree in Manchester, NH (Hi Michelle - Tasha - Becky and Carole!) 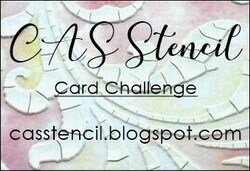 but I missed last weeks inspiration challenge over at Split Coast because I was at The Stamping Around Weekend in CT and I didn't want to miss another one! Stef showed us a web site called Tracy Porter for us to find our inspiration. I used my PTI damask set that I just had to have but hadn't inked up yet (! ), a nestie tag trio for the sentiment and an SU ribbon slide (another thing I don't often use for some reason!) The fleur de lis's were punched with an EK Success punch. And now - as promised - Here is some fun blog candy to celebrate my reaching 100,000 hits on my blog! Whoo Hoo!! With a big thank you to everyone who has stopped by my blog - those who come everyday - or once in a while or by random chance!!! I really appreciate it and hope that it means you find inspiration from my postings. 2. Thomas Kinkade Hometown PrideVignette Stamp by Cornish Heritage Farms. 3. Foxy and Birdie Snag'em Stamps by Imaginisce. 4. An Ornare corner piercing stencil. All you need to do is leave a comment on this post by 6 pm EST Wednesday 7/22/09. I will randomly choose a comment number and post the winner on Thursday. If the winner doesn't contact me within 24 hours I will pick another number. So good luck! 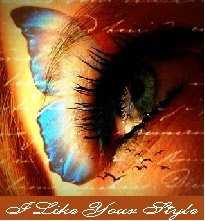 and thank you again for checking out my blog - and especially for leaving me comments so I can visit you also!! I made this card for the sketch challenge on Split Coast, as well as the Doubledog Dare Challenge I do with some SCS friends. Francie G's challenge to us was to make a wedding card. 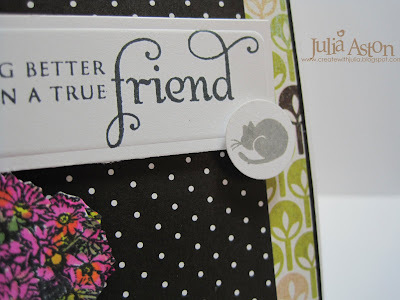 I used Waltzingmouse Stamps for my card today and Papertrey Ink papers and inks. We'd love to have you join in on the Doubledog Dare challenge - just put DDC in the keywords when you load your wedding card into your Splitcoast gallery. You can see all the Doubledog Dare cards here. I just passed 100,000 hits on my blog a few days ago - so there will be some serious blog candy available to win soon so be sure to keep checking back! 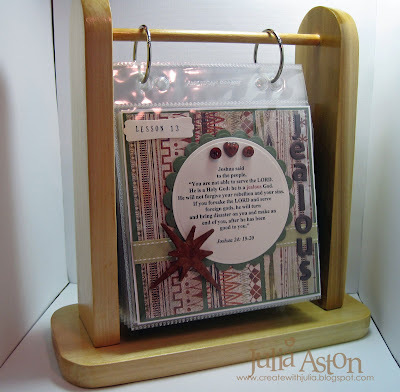 I submitted this basket and card set for the July Guest Designer challenge over at Papertrey Ink. One of the categories was to use a template - another was to use the new Vintage Picnic set. For my project - I used Lauren's Basket Basics Timeless Template as well as the Vintage Picnic set, the Vintage Picnic sentiment set and one sentiment from Mail Box Greetings (the one on the basket). I also made 4 little 3x3 cards from Pure Poppy and Kraft card stock to tuck inside the basket - thinking this would be a cute little gift to give a friend that has moved away. I will add envelopes to go with these after I decide if I want little ones that will cost more to mail - or just use regular size ones so they will take one first class stamp postage. Or the cards could just be tucked into a gift!? I inked all the edges of the basket as well as the Kraft panels of the cards with the Chai tea dye ink. I colored the baskets with Copics. I cut out the basket and layered it over a Labels Four die cut panel. The parcel of letters is stamped separately, colored and layered under the basket with foam dimensionals. Here are the Copics I used for my coloring. Nicole will be picking the winners and honorable mentions today (7/15) I was fortunate enough to make the honorable mention the last two months so I have my fingers crossed again! 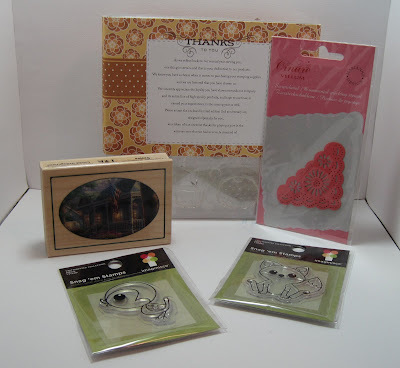 Accessories: PTI: Basket Basics Template, foam dimensionals, corner rounder, Copics, large brads: American Crafts, PTI Pure Poppy saddle stitched ribbon, Labels Four Nestabilities, Tag Trio Nestabilities. 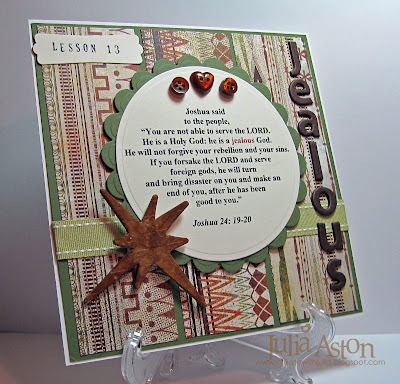 I made this sympathy card for the CAS (clean and simple) challenge on Split Coast. We were given this art web site to browse through for inspiration. I wanted to use my new Waltzingmouse Irish Blessings & Celtic Heritage stamps so I searched for Irish artwork and I found this lovely Celtic Cross poster . I stamped the Celtic cross with Chai ink, cut it out and layered it over a Labels Four Nestability frame with foam dimensionals. I sponged the edge of the frame before popping it out of the die and that left the nice white edge. I added the small PTI Vintage button to the center with a glue dot. I stamped the sentiment in black and the chain borders in Ocean Tides Ink directly on the card stock. Thanks for coming by today! I'm off to make my supper now that I've gotten my card done! Gotta get the important things done first - right?!?!? The featured stamper on Split Coast this Sunday was Kelly (Schirmcat) of the Naughty and Nice list fame! I found myself on her nice list last November and somehow that wasn't the list people wanted to be on!?!?! Being on the Naughty list was more prestigious! LOL!! Oh well - at least I made a list.....! I have been wanting to use my Papertrey Ink vintage basket stamps so I cased Kelly's pretty Giving Thanks card where she used one of them. I changed the background and sentiment stamps, the contents of the basket and colors of the buttons but kept her nice layout. I inked all the edges with Chai Tea Dye ink. The flowers are stamped right on the card stock and I colored the flowers with Copics and my white gel pen. The basket is cut out, colored with a Mustard color Copic and popped up over the flowers with foam dimensionals. I also added two cute flower brads where the handles are attached to the basket. Hope everyone had a great weekend - we had perfect summer weather for 3 days - now it's back to work in the morning. Look What We Made at Stamping Around! Hi everyone! Here is my report from the 2nd and final day of Stamping Around Connecticut and I wanted to share with you the fun projects we made. Then our first class this morning was taught by Debbie Corbari. Pictured are Debbie, Julie Masse and Kim Schofield. 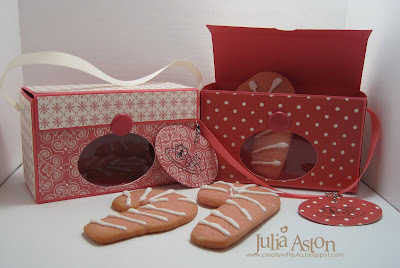 This is the fun project we made with Debbie - a cute little boxy bag (or is it baggy box???!!) and pretty layered tree card. Debbie is a stamp designer for Our Craft Lounge and we used one of her very own sets for this project called Swingin' By. How COOL is that?!?!?! We also used a really neat product called Sparkly Fluff on these cards. You probably cannot see it on the pics but we used it on the wings of the owl, the flowers and the tree trunk. It adds a sparkly fluffy dimension to the card. Next up was Kim's class (she's one of the organizers of the workshop). We made this adorable box out of kraft card stock and 4 3x3 cards to slip inside. All the stamps on the cards are from a super set by Unity Stamps called Perfect in EveryWay . Then we had our lunch break but snapped a great group picture before chowing down! And here's a shot of the teachers, Debbie , Donna , Kim, Julie & Me! After a short lunch break we're right back to stamping away - and Donna Marie Cecere had us making this really interesting layered card. 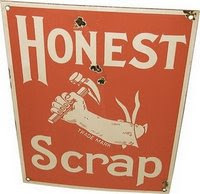 The background was stamped on orange, green and red paper as well as on a piece of acetate. So using the orange piece as the base -we cut out pieces from the red paper and the green paper and attached them onto the orange. Then we colored various areas with sparkly markers. The acetate piece was attached to the Sizzix die cut frame and the frame was attached over the orange base with foam dimensionals. So what we ended up with was this great 3D look - which can't really be appreciated from this picture but IRL it has great depth to it! Now as you can probably imagine - we are all pretty tired by all our efforts by this time (yes even we avid stampers can get exhausted!!!) But we had one more class to do before we could rest!And that class was lead by Julie Masse and look at the fun blocks that we made with her!!! These beautiful stamps are by Kitchen Sink Stamps from a set called Multi Step Berries. With these stamps you use 2 or 3 colors over-stamping lighter to darker, Each berry has 3 stamps (they are labelled on the sheet they come on) and look at the result you get from them! These are small 2" wooden blocks that Julie had already painted white for us - and we stamped the berries and leaves on each of the 4 sides. 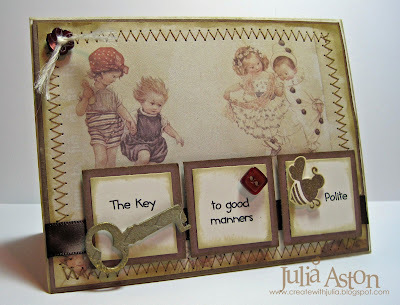 Julie is on the DT for the company so check out her blog or the store gallery to see how the stamping is done. And one final picture - and I'm dropping into bed! We all made name tags for ourselves at home before we came to the weekend - and everyone voted for the one they liked best - and I won with my little birdhouse DP and chipboard letters name tag (Whoo Hoo!!) - my prize was this pretty stamp set by Gina K called Tropical Flowers. Ok - I'm exhausted! Sorry for the long post - hope you lasted to the end! Don't you wish you had been here with us these 2 past days?!?!? Check out the next Stamping Around Weekend that will be in VT in Sept - I'm going there too - just as a participant next time - and I can't wait to see what we'll be making (and winning!) then!! Hi from Stamping Around in Farmington CT! Hey everyone! Well - I'm here in Farmington, CT - this is the building most of us here at the Stamping Around Workshop are staying it. It's at the Centennial Inn and you can see the weather is just super! There's a pool just across from our building and I'm hoping to be able to hop in it after the workshop ends. DH came with me so we're making a little mini vacation out of the weekend. Here are Kim Schofield and Julie Masse, organizers of the event. Friday night was a PJ party - so we were all wearing PJ's.They are raffling off a stamp set - one of the many prizes we could win over the weekend. I taught the first class Friday night - we made two bird houses - both free templates from Nichole Heady's blog. You can see everyone busily working on their projects. And here are two of my fellow teachers for the weekend, Debbie Corbari (left) and Donna Cecere (center). These girls are just a riot to be with - we ate dinner together on Friday night at J. Timothy's Tavern (a super pub type restaurant) when we first arrived and talked stamping the whole time! 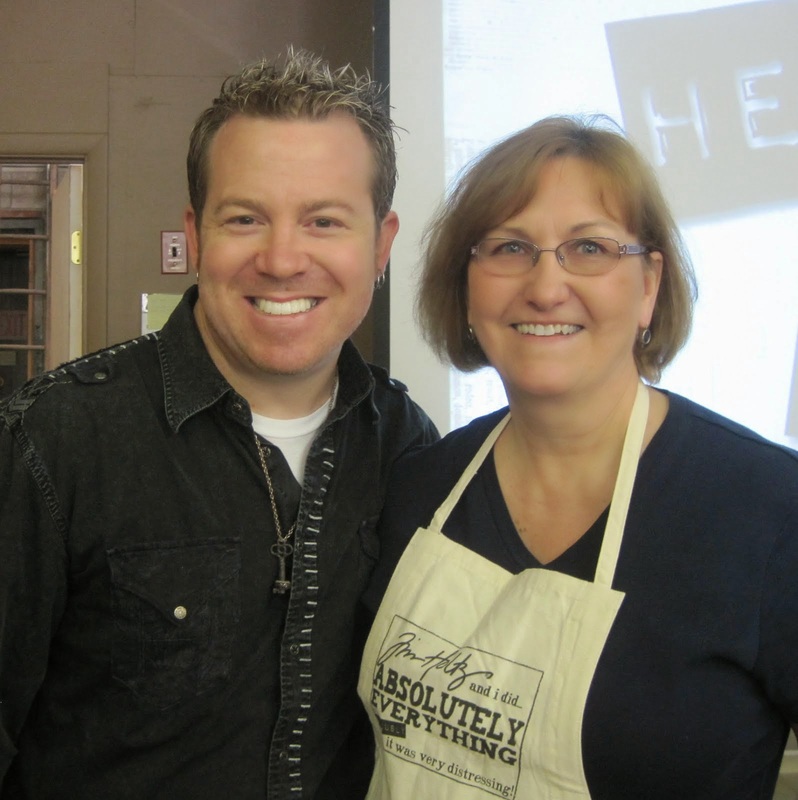 Well - gotta go - the Saturday classes are about to start and Debbie is up first - I'll be back later with more pics!